Sweet-toothed bookworms were in heaven Wednesday afternoon during SBCC’s Second Annual Edible Books Festival. Showcased within the college’s Luria Library — and in collaboration with the school’s Culinary Arts and Great Books programs — the event allowed students, faculty, and staff to flex their cooking muscles by creating eatable entries that fit into one of three categories: looks like a book, acts like a book, or is a pun on a book. Part of an international Edible Books Festival — which is held annually in a number of countries sometime around April 1, the birthday of famous French foodie Jean-Anthelme Brillat-Savarin — the event marked SBCC’s second year of participation. “Because of the crazy success of last year, we just had to do it again,” exclaimed SBCC librarian and event organizer Elizabeth Bowman. A total of 23 dishes were submitted, with the chefs all vying for prizes and bragging rights amongst their peers. The casual observer would assume that the bodies behind the creations were all experienced cookers, with years of baking under their toques. It turns out, from speaking to the “authors” in their signature white, double-breasted coats, that many are newcomers to the program. 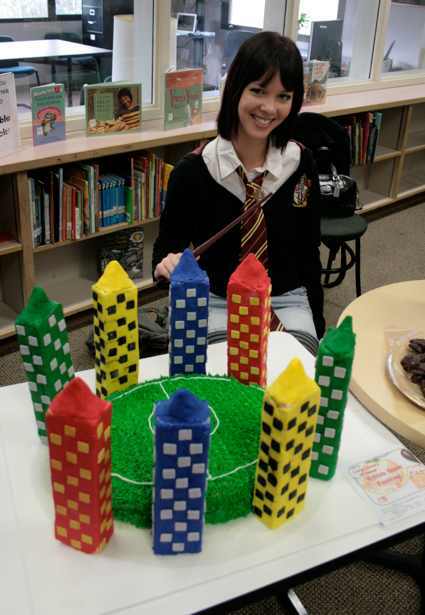 One first semester culinary student Heather Harmon, a die-hard Harry Potter fan, surprised spectators and judges alike with her decadent cake of a Quidditch field (the playing surface on which Potter characters play their fanciful sport). Milling about the corner of the library, adults and kids alike were tickled by the imaginative and inspired edibles in front of them. While many were in cake form, a few of the entries took a more liberal approach to the called-for artistic representation. “Lord of the Onion Rings” (as one might expect) included a row of tasty, crunchy-looking onion rings on a bed of lettuce and what appeared to be a cranberry sauce. “Splenda in the Grass” showcased the brilliance of simplicity with a Splenda packet perched delicately atop a pot of real grass. And “War and Peeps” featured a two dimensional smattering of the neon marshmallow bunnies, a clear favorite amongst the younger crowd. The sound of mom’s smaking the hands of their wide-eyed kids as they reached to grab and poke could be heard throughout the room. Not to be overlooked, there was also a representation of Truman Capote’s In Cold Blood, a bowl of cold strawberry soup sitting atop a bed of frothing dry ice. 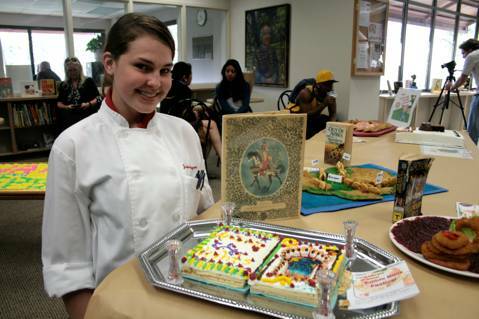 Taking the assignment more literally, culinary program participant Jasmine Anger created a cake book based on Andrew Lang’s Arabian Nights. “My family is really into all things Middle Eastern,” explained Anger, “and my uncle runs The Tent Merchant [on East Haley Street].” Her family, continued Anger, also owns 200-300 copies of the famous novel and their passion provided an easy jumping off point for her work. Anger’s cake utilized the Baumkuchen layering technique which allowed her create the “pages” clearly visible around the perimeter of her cake. “I’m loving baking more and more,” she said. Other fanciful pastries included a 10-layer cake in the form of a shark’s head motivated by Peter Benchley’s Jaws, a pastel-colored, multi-tiered marvel based on Dr. Suess’s Oh, the Places You’ll Go (which, when cut into, revealed many layers of rainbow cake), and a green tea cheesecake spurred from This History of Tea. It was described by Bowman as “rich but super elegant.” Rounding out the whimsy was a Mad Hatter cake derived from Alice in Wonderland. 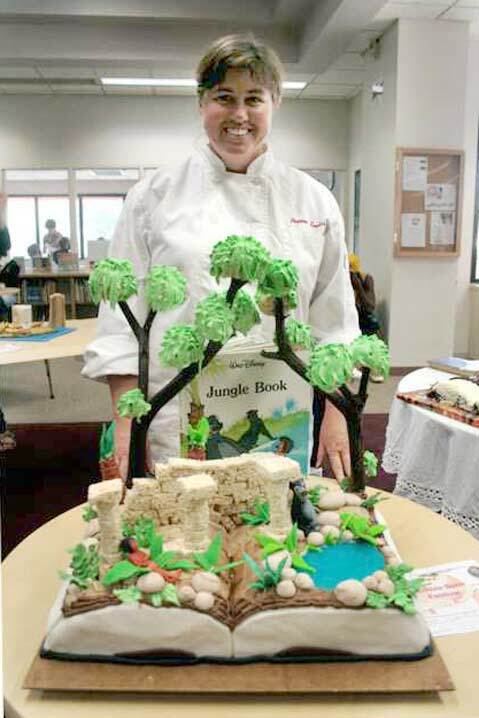 Far and away the crown jewel of the afternoon’s showcase was first semester culinary program student Pegeen Soutar’s “Jungle Book” cake. Made using a number of baking techniques she had recently displayed during a midterm, Soutar said she was inspired by the fun and vibrant colors of children’s books, and thought the palate would serve well for her invention. Her creaming method cake, she said, included royal icing, fondant, melted sugar, and meringue. 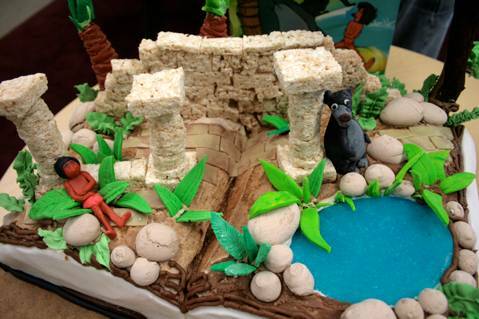 The combined ingredients served to create an intricate and fanciful jungle scene complete with figurines of Mowgli and Baloo lounging under a canopy of frosting. Not counting prep and experimentation time, the cake took Soutar over 20 hours to make. The blood, sweat, and sugar put into the project paid off for Soutar, though, as she took home the “Best in Show Prize.” The judges, whom Bowman said took their task quite seriously, included culinary program alumn Chris Warrick who’s now a chef at tapas restaurant and wine bar AVANT in Buellton. Once it was time to cut-in and start tasting, 100 people reportedly lined up for some fiction and non-fiction flavor.